Do you swear by certain products that worked so well that you always tell your friends about them because you want everyone else to benefit from it? That’s how I feel about homeopathic Bach RESCUE remedy. It’s my best-kept stress relief secret — and I don’t want to be a secret. 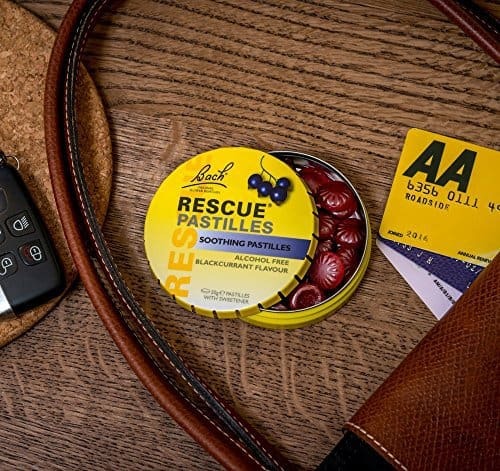 Over the years, I’ve given boxes of Rescue pastilles to friends and family member so many times, I should’ve bought stock in the company by now. Bach RESCUE comes in handy in so many situations — when you are nervous about a conversation or an interview or a test, or when you can’t fall asleep. I always have RESCUE in my handbag and my car. Developed by a doctor 80+ years ago, homeopathic Rescue products have helped millions of people around the world stress less, stay calm and in control. A blend of five of the Bach Original Flower Remedies, over-the-counter Rescue products provide gentle, non-habit forming , everyday stress relief. They come in drops that can be taken by themselves or mixes with water or juice, pastilles, and other forms, for day or night use. I love the pastilles the most. This post contains affiliate links for your convenience – read more here. You can click on the pictures to by the product. I don’t remember when I came across RESCUE for the first time. I think it was back in Germany, where I grew up with homeopathic remedies. That was over 20 years ago. I’m sure my mom used it, who is a health nut like me, and then I started using it. RESCUE helps you stress less and stay calm in any situation that you are worried or anxious about — with ingredients found in nature. RESCUE was developed by a doctor and is safe and non-habit-forming. It has no side effects, has been trusted for generations since 1930, and is used by millions worldwide. I took it before my valedictorian speech, before I walked down the aisle (well, the rose garden lawn in our case), and for many years every time before I stepped into the dentist office. When Landon developed teeth issues at not even 2 years old and needed crowns, I wasn’t willing to put him under, which meant working together with the dentist to get Landon through the procedures. When he needed two crowns, I had to hold him down and keep him calm so the dentist could fix his teeth, while I had to keep calm myself. The ONLY way I made it through those tough couple of hours was by talking Bach Rescue Remedy — it helped me not to lose it in front of Landon because I felt so bad that he had to go through this at such a young age. Taking RESCUE helped me with the stress and worry of those days. After many years of dental issues, Landon is not afraid of the dentist, and I know RESCUE is one of the reasons. I was able to keep calm and strong for him with the help of the Bach pastilles, the drops helped him to not stress out, and he never developed a fear of the dentist. That is so important to me because I was terrified of the dentist as a kid, and I never wanted him to go through that. I used to use the drops, but now the pastilles are my favorite. They taste like yummy gummi bears. It is so nice to have a natural remedy to help me with stress, in such an easy form like a pastille. So if you haven’t tried RESCUE yet, I highly recommend it — and then you’ll want everyone else to know about it, too. These are amazing! I keep the spray on hand, don’t know what i’d do with out it! I didn’t know they had something for humans! cool about the stuff for humans…even little ones….. I love Rescue Remedy! I’ve been using the drops for years and they are fabulous. I even gave some to a cat I had that would get very stressed when going to the vet, and it helped. I used a separate bottle just for the cat.